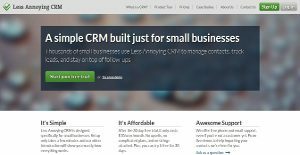 Less Annoying CRM is a simple cloud-hosted customer relationship management platform designed for SMBs. The system provides straightforward usability, flat pricing, and free support. It is easy to set up and can be deployed in minutes. Less Annoying CRM offers sales force automation and capabilities for effectively managing contacts. The platform allows users to consolidate all of their information about customers in one secure location that team members can easily access. The product is equipped with various modules for managing leads, tasks, calendars, and notes, among others. A range of configuration options offers customization functionality that allows users to configure sales and lead processes and lead definitions, thus enabling them to align their businesses with their unique workflows and industry needs. Less Annoying CRM provides a worry-free system that do not require any maintenance or updates on your part since these are all taken cared of by the vendor. It offers a 30-day free trial so you can test drive the product and determine if it addresses your business requirements. Simplicity is the hallmark of the system. It has an easy to use interface with all information on contacts well organized into sections and easily accessible. All contact information and communication including emails, notes, and updates are kept in a centralized and safe cloud location. Less Annoying CRM enables you to track leads in all their stages so you can determine which needs prioritizing and following through by your team. It displays all summaries of activities as well as CRM functions. You can quickly view information on activities, leads, status of tasks, and an activity feed. Since each company has specific business requirements, it is prudent for them to abstain from searching for a one-size-fits-all faultless software application. Needless to say, it would be pointless to try to find such a system even among popular software platforms. The smart thing to do would be to list the various important factors that require consideration such as required features, budget, skill levels of employees, company size etc. Then, you should do your groundwork thoroughly. Read some Less Annoying CRM reviews and look into each of the other apps in your shortlist in detail. Such comprehensive groundwork can make certain you reject ill-fitting systems and choose the system that offers all the elements you require for business success. We realize that when you make a decision to buy CRM Software it’s important not only to see how experts evaluate it in their reviews, but also to find out if the real people and companies that buy it are actually satisfied with the product. That’s why we’ve created our behavior-based Customer Satisfaction Algorithm™ that gathers customer reviews, comments and Less Annoying CRM reviews across a wide range of social media sites. The data is then presented in an easy to digest form showing how many people had positive and negative experience with Less Annoying CRM. With that information at hand you should be equipped to make an informed buying decision that you won’t regret. Very attractive. Highly intuitive. Simple to use. A CRM that's both user-friendly and easy to utilize. A cloud-based software that's both powerful and intuitive. A CRM that's rich in features while keeping things user-friendly! What are Less Annoying CRM pricing details? What integrations are available for Less Annoying CRM? Pros: I like intuitive it is as a fully functional CRM. Their wide range of panels are very attractive. Importing data is easy. Exporting data can also be done when needed. I like how its wide-ranging default fields are extremely useful. Cons: I was hoping there's a way in saving responses that have been canned. I wanted to have a way to gain access to them when directly dealing with customers. Pros: The more I come back and utilize this app, the more I end up unearthing its functionality. I appreciate everything that it has to offer! I love its customization options. The UI is intuitive and easy to understand. Cons: Currently, it's lacking an Android mobile app. There's no feature that lets you re-assign potentials and leads. I like how LA CRM is entirely cloud-based. It's zippy. I can use it on any device. What's more, it can be customized. Setting it up was a cinch plus it's user-friendly. I like how I get to keep my tasks and calendar items. The same goes with contacts and other follow-up details. All these in one convenient location! Super simple to do! Simply amazing and user-friendly too!